Update December 31. – In Phil Taylor’s book about David’s black Strat (see review here) it appears that the guitar was displayed in Dallas, not Miami as suggested here. I have asked David Arroyo, who kindly contributed this picture, if the picture indeed was taken in Dallas and he replied that it might have been. Nevertheless the guitar on the picture, fits Phil’s description of how it looked after they had gotten it back in 1997. A couple of days ago I was given this unique picture of David’s legedary Black Stratocaster hanging at the Hard Rock Cafe in Miami (Florida USA). The pic is taken (and kindly contributed) by David Arroyo in 1996. The guitar was given to the Hard Rock Cafe sometime in the late 80’s and it hang there till David took it back in 1997. 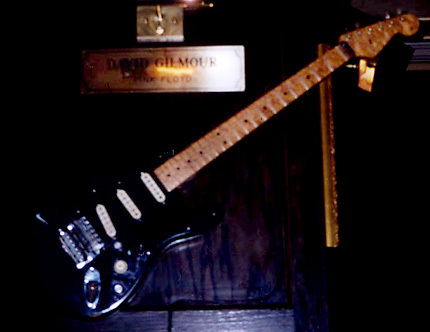 The guitar was hanging at eye level over a table with a sign saying “David Gilmour – Pink Floyd”. The guitar has the Charvel neck and the Kahler tremolo system used during the About Face era. What’s interesting is that the guitar was left unsecured without the glass cabinet often used at the Hard Rock Cafes, which leads me to wonder how many of the scratches we see on the guitar today dates from this periode. As you can see, it’s missing the volume knob and the lower tone knob. This site is so exciting. I absolutely love what you’ve done Bjorn. all that has been said and reviewing pictures and specs, its almost beyond anyones power to make something exactly like that. And if they did, where is HIS guitar? Is it just me or does that neck look like bird’seye or some type of flamed maple? I think it’s odd that they’d fill in the hole from the Kahler and paint that area, but not repaint the entire body. I know it was touched up before Pompeii, right next to the neck pickup, but when he had the rosewood neck installed, it got a rather nice paint job. I guess he really likes collecting vintage guitars. I have to say I am not surprised at the condition of guitars in HRC. I was in San Antonio this summer on my honeymoon and snapped a pic of one of EVH’s guitars and one of SRV’s donated guitars. Both of them were exposed and just hanging there. Really a sad state of affairs if you ask me. IF “resouce” was spelled “resource”, would you want to know? Bjorn, I don’t know if you remember me. I was the one who sent you some pics and gave you some info on some Strat’s that Gilmour used. I am almost positive I took some pics the Dallas hard Rock Cafe back in 1991. I now have to 1.) find them and 2.) scan them. I am 100% positive that this axe was in Dallas and NOT Miami. I think it’s a shame that the HRC would allow ANY memorabilia “unprotected”. Now that I’m typing this, I remember where this very strat was at. I annoyed a couple eating to snap a pic of this. That’s what I was saying. The location definately had to be Dallas and not Miami. Hmm, from reading Phil’s second and “nastier” letter to the Hard Rock Cafe, it seems that the guitar was on display in Dallas. Phil also mentions that went and seen the guitar on display and that it was in good condition, and he insists that all of the damage done to it must of happened when it was taken off display. “Thank you for returning the above guitar. I have just received it. I am very disappointed to find the guitar in such a state. When I sent it to you, it was in fine condition, and when I have since seen it on display in Dallas, it looked the same. Most of these parts must have been removed when it was taken off display. Please look into this and let me know what you propose to do about it before I take the matter any further. I was noticing while looking at the aformentioned pdf from david gilmours page that the “damage” listed on the letter of complaint to hard rock is identical to what is apparent on the picture.”Apart from the guitar being in filthy poor condition there are several missing parts. Dallas seems to be the actual location of the Hard rock that the strat was in. This at least goes along with the issue of Guitarist back in 1995. Phil Taylor asked for it back from Dallas, so that may have been where the guitar began it’s residence in the hard rock collection (They move their collection around) also it took them “several months” -taylor p.99 so my guess is that hard rock was desperetley trying to track it down in their large restauraunt system. So maybe Walter and his other co-workers at the time weren’t playing around with the real thing? Or maybe it was moved around to different places? Anyway, apologies, I’m being pedantic. None of this is really important, the fact is we have to wait another two weeks to get our hands on the book! Keep up the great work on the website Bjorn, you deserve an award. I read Gilmour saying somewhere (I think it was guitar world in the late eighties) that he wasn’t too attached to any one guitar. This plus the fact that he was playing the EMG equipped vintage reissues my be why he let the guitar go. Obviously that change since he has it back now. Good Lord! What a shoddy way to treat such a fine instrument. Makes me wonder why the hell Mr G would ‘loan’ his famous ‘Blackie’ out for so long. He couldn’t have cared for it much. There’s no way on earth I’d do it! Kind of like the prodigal son has returned. Spent months reading and enjoying your website so would like to make a small contribution. I wrote to GHS asking about the DG signature set and also which gauges of Boomers David actually uses. I got the following reply…. “Art work is in the final production. Probably be available in November sometime. He uses for his Fender Strat 010-012-016-DY28-38-48 and for his Les Paul 010 1/2-013-017-DY30-40-50. Yes you can see the Roland pickup behind the bridge pickup. It seem both Gilmour & Renwick had more than one Stratocaster at Live 8. in the reheral footage on the Live 8 DVD we can see Gilmour playing one of his red strats, so it stands to reason that Tim would have had a back-up too. not sure if theis has been discussed before, but the cream strat seem to have reappeared on the new DVD, this time being played on one song by Guy Pratt. – Yes. I bought it new, from Chandlers shop in Kew, in London about twelve years ago. It is sea-foam green having American electronics (Seymour Duncan Alnico Two pick-ups – single coil except for bridge position which is a dual tapped humbucker) and Japanese wooden parts. It has a pearlised scratchplate and was assembled by my friend Brinsley Schwartz for Chandler Guitars. It actually looks turquoise to me, but Iâ€™m a bit colour-blind! Hey Bjorn, what about Fender’s Black Strat replica release? I recall hearing somewhere that the hard rock keeps all of it’s collection in a warehouse (in orlando Florida I believe). And doles it out to the cafe’s as needed. So if this is true it’s being in miami was pretty close to chance. Well If its true that Gilmour actually was insane enough to lend that Guitar to anyone, There can only be one explaination!!! ……Too much [edit – Bjorn]!!!! The dam 80’s for ya!! This is a fantastic sight …..Gilmour Rules!!!!! I used to work at the Hard Rock CafÃ© in Miami from 84 to 91, I remember that guitar pretty well ! Once in a while we used to screw with some of the axes hanging their, it’s actually by doing that that I got into the whole Travis Bean obsession I still have with guitars, not a big ” strat ” fan, for anyone who’s ever played a Travis you know that feeling ! I remember that it was pretty heavy for a Strat, probably the vibrato on it, the 5 way switch didn’t work on it either. Wow, that is truly a shame that the guitar was displayed in such a way. What is surprising to me is how recent the Kahler was replaced with the original trem. I remember hearing that David replaced it after the About Face tour and somewhat used the guitar on the AMLOR tour. I had forgotten…thanks to David Arroyo and you for the pic ! Very interesting ! Almost unbelievable ! It makes me feel like buying the Taylor’s book. thats not the guitar i think, the neck is flamed maple. I’ll say this….the US is LOADED with guitars signed by musicians. It just seems like 99% of what I ever see in these types of places are Squires instead of USA Strats, no attention even paid to what hand and the player is and the guitars always seem to be brand new. This is where the Hard Rock is supposed to separate from these others. So, I gotta believe it’s legit. Aaaah great, thanks for that Bjorn! This guitar belongs either to David himself or in a museum!!! Unbelievable… Well done, Bjorn, and many thanks to David Arroyo for the pic ! Here’s what I’ve managed to extract from the scans of Phil’s new book. The parethesis marks where I’m not sure what it says or did’t catch at all… but you’ll get the idea. Phil doesn’t mention Miami, as I thought I’d seen but he mentiones that the guitar had both the Charvel neck and the Kahler when they recieved it back from HRC. It was now May 1999, the Black Strat had been on display in the Hard Rock Cafe for over (ten) years. If David was ever (…) it again, it was (….) it’s return. When contacted, The Hard Rock Cafe were rather surprised to be asked to return that guitar. Claiming no knowledge of the existance (…) appearance, they were under the (….) that they owned it. The original paperwork was produced to clear up any misunderstandings. The Black Strat arrived back in England several months later, sadly not in the same condition as when it (left) and without its original black case. (…. ), the guitar was sent to Charlie Chandler’s guitar workshop to be repaired. ahh the 80’s. it even got to gilmour too! Bjorn, do you already have a copy of this book? I would say this is a replica, not the original. I am more or less shocked that DG would give his favorite axe to a food chain! I think he must have had a love/hate relationship with this guitar. However, I remember the 80’s very well and it was not rare to see folks trading in there vintage tube amps and such for solid state gear and other stuff that would make most of us cringe just thinking about it. My other guess would be that perhaps he wanted to shed the feeling of being the lead guitar player of the Pink Floyd with Roger Waters era. Giving up his Floyd axe would be like saying goodbye to that era. thats just a guess though. Strange that is. Hanging that wonderful and irreplaceable guitar on a wall for all kinds of people (or shall we say animals) to touch and steal knobs and so on.. It’s more worthy than that in my opinion. But I guess it’s as you say: he couldn’t have cared for it as much back then as he do at this point in time.. I’m certainly glad it’s back in Gilmour’s magical hands! But this got me thinking though.. I have a suggestion for you BjÃ¸rn. Why don’t you make a poll where you ask all of the Gilmourish-fans which Gilmour-guitar they like the most, like Gilmour to play, or something like that? Having a monthly poll could have motivated us in the Gilmourish-society to discuss more, share our views and get to know each other a little better. Just a suggestion that is. The real question is: why David Gilmour went back to this particular guitar? What make it so special ? This man, which has the most expensive guitars in the world, keep playing with this one, which is not more than a Stratocaster like thousands of others. This man is able to take a ukulele and make it sounds like a stradivarius. Why this particular one ? Is it a pure sentimental matter ? Crazy indeed! I do find it hard to believe that it is the original black strat, and that David just asked for it back one day. Either way, Im very excited for Phil Taylor’s new book!! Any idea why Miami? Miami doesnt really have a big rock scene either. i would have stole that so fast, no matter what the sentence! That’s crazy! I can so easily picture some guy reaching up there while eating a burger and swiping a knob. yeah Bjorn can you explain this? oh man….i got a bit naucious reading this. well….at least he got it back…. I find it hard to believe that David Gilmour would have lent that classic guitar to anyone!!!! I find even more hard to believe the disrespect the hard rock had for not encasing it in glass!!! Are you sure that the guitar was truly THE Black stratocaster that he had since live at pompeii??? That’s amazing that they would just leave it there without any securing measures… and that David would let them have it for so long.